Butler University is the only Midwest Regional University to earn the U.S. News designation as Most Innovative School, according to the magazine’s 2018 rankings released on Tuesday, September 12. For the eighth consecutive year, Butler ranks No. 2 overall among 171 Midwest Regional Universities. Butler is also recognized among the best in the nation for four co-curricular programs that enhance the educational experience for students. U.S. News created the Most Innovative School category three years ago “so high-ranking college officials could pick schools that the public should be watching because of the cutting-edge changes being made on their campuses.” Butler has claimed the top spot in the Midwest Regional Universities category every year. -co-developing technology solutions for higher education with partners including High Alpha’s ClearScholar and Salesforce.org. Butler’s commitment to innovation stems from its goal to prepare graduates to make a meaningful impact in the world. This year’s U.S. News rankings list Butler among the best in the nation for internships, the first-year experience, study abroad, and undergraduate research/creative projects. Internships. Schools that make this list require or encourage students to apply what they’re learning in the classroom to the real world. Seventy-five percent of Butler students graduate having completed an internship. In the Lacy School of Business, all students are required to complete two internships. First-Year Experience. 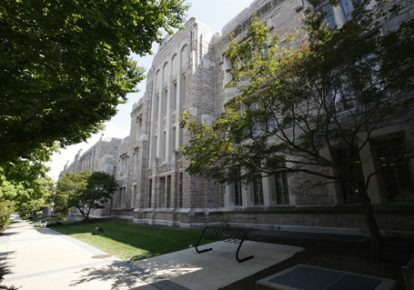 According to U.S. News, “Many schools now build into the curriculum first-year seminars or other academic programs that bring small groups of students together with faculty or staff on a regular basis.” Through Butler’s first-year experience, students know what to expect inside and outside the classroom through peer-to-peer and faculty engagement. Study Abroad. Programs ranked in this category are recognized for substantial academic work abroad for credit—a year, a semester, or an intensive experience equal to a course—and considerable interaction with the local culture. One-third of Butler students study abroad, and cite their experiences as some of the most transformational and enriching of their time as undergraduates. Undergraduate Research/Creative Projects. Through the Undergraduate Research Conference—the largest in the Midwest—the Center for High Achievement and Scholarly Engagement, and the Butler Summer Institute, Butler encourages students to investigate and explore research projects alongside faculty mentors.